Hi Everyone! Yesterday was Labor Day here in the US, which meant a wonderful long weekend! The most unbelievably thing happened, Houstonians actually enjoyed a relatively mild Sunday and Monday, the highs were in the low 90’s! We took advantage of the weather and got to enjoy sitting outdoors for a while, people watching and having a snow cone can be very entertaining! Little girl wanted to do some fun activities while she was out of school on Monday, I couldn’t think of any crafty things to do, so baking was the next thing on our agenda. There were some frozen bananas in the freezer that I’ve been wanting to use, though after so many attempts of making banana breads and never been that successful at it, I was not sure whether this was going to be the best idea. I decided to look for something healthier, which normally means less tastier, but who knew this recipe actually turned out to be a big winner! Instead of butter I used apple sauce, which made the bread real moist and tasty. After the initial tasting and photo taking, I devour a second piece quickly while telling myself it’s really not big of deal since it’s so low in fat. Haha, Hooray to healthy recipes! Preheat oven to 350 degrees F (175 degrees C). Spray one 9x5x3 inch loaf pan with a non-stick cooking spray. In a medium bowl, beat the sugar and margarine or apple sauce until smooth and creamy. Beat in the eggs, soy milk and bananas with the sugar mixture until it is well blended. Mix in the flour, baking soda, salt and cream of tartar just until the mixture is moistened. Be sure to scrape the sides of the bowl to blend all ingredients. Bake at 350 degrees F (175 degree C) for about 60 minutes. Bread is done when the top is firm to the touch and a golden brown color. Time will vary according to loaf size and oven type. When bread is removed from oven, allow it to cool on it’s side for 10 minutes, then remove from pan and let cool on a rack. This bread is also excellent if you add mini chocolate chips or small fruit pieces to the mix just before baking. Looks fantastic and the idea of using soy milk just seems so ‘Mmmm” delicious! Yes, apple sauce instead of butter does the trick! I do think it makes the bread more spongy and not as cake like, which is just fine, as long as I don’t feel as guilty eating it! Using Rice Cooker to bake? That’s so interesting! I just read up people use Slow Cooker to “bake”, gonna have to give it a try one of those day… I don’t usually bake because I try not to have sugary/carby treats at home, too hard to resist! Apple sauce and soy milk! That’s something I want to add next time I make banana bread. I used to make once a week but I’ve been so busy I realized I haven’t made for over..4-6 months?! It’s about time to try some new way to make banana bread. Your banana bread is so moist and delicious looking Cindy!!! 4-6 months?! I don’t blame you Nami, meanwhile you have been making all kinds of other yummy treats for the family! I think using alternative ingredients does make the banana bread more spongy and less rich, but Trini and I are both very happy with the results this time around, if you do find the time to make it, let me know your thoughts please! Yummie! 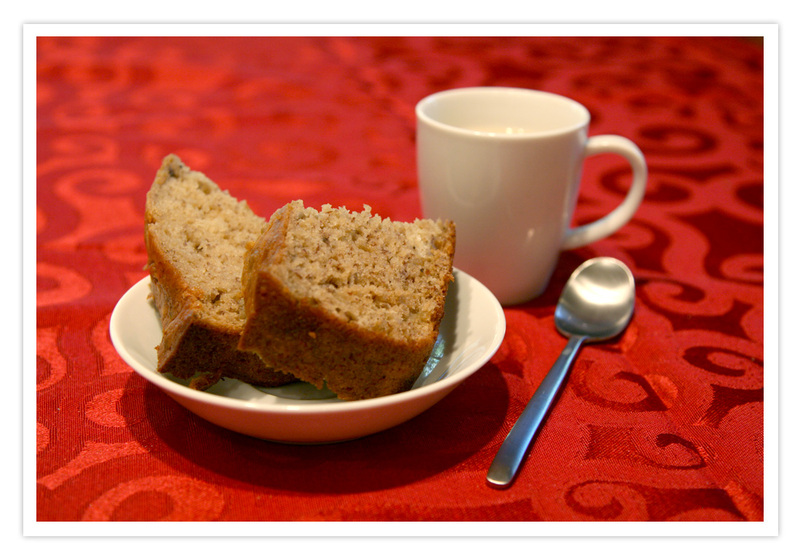 Your banana bread looks delicious, and even better for being low fat, so I can have an extra slice. Hi Juliana! Thank you! Personally I am not a big fan of bananas, but when they come in bread/cake form, I can’t get enough of them! Saw your lemon chiffon cake, oh my!!!!! I love how light it looks, can’t wait to go through your website to see more of your creations! Do you have a FaceBook fan page? I tried to subscribe to your blog via RSS but an error happened, I’d love to keep up with your recipes! Jeno, you cake really looks perfect: moist, light, low-fat and using leftover bananas (I seem to have leftover, dying bananas all the time). I also sometimes bake an apple sauce cake and I agree this is a great way to avoid butter or other fats (or at least lower their amounts). Thank you Sissi! Do you have any great apple sauce cake recipes I should attempt to bake? I have one recipe I took from an American cookery book. Maybe I’ll simply post it one day? I have already taken photos to do it anyway… I will try to do it quickly! Mmmm I love banana bread! Can’t wait to try this low fat version. Hi Katherine! We were surprised at how well this low fat version turned out, especially for a non-banana lover like me. Hope you will like it also! I am not a big fan of bananas, though when they are in bread form, the strong taste subsides, all that I taste is the delicious carbiness! Your idea sounds intriguing, hope you do make it one day! Hello Shilpa! Thank you for the kind words! I think my dislike of bananas started back at Taiwan, growing up my Mom would tell us it’s not OK to drink water after eating bananas (Chinese people believed it would cause some kind of discomfort), and since bananas are dry, I would get thirsty eating them, and not being able to take a drink of water made the whole experience quite unpleasant… I just checked out your website with Jenny, there are so many yummy postings! Will have to go through them and see what I can make! Thank you Malli for visiting my little blog! I really did enjoy making that particular banana bread after so many failed attempts. Please let me know how it turns out if you ever decide to make it! Have a good day. Hi Christy! Welcome back to the blog world and congrats on your marriage!!! I have been slacking off lately, a bit stressed at work and can’t bring myself to focus on documenting my food journey except some updates on FaceBook. Looking forward to read more posting from your wedding! My kids adore Banana bread, this will be soo good. Hello Reem! I hope you will give this recipe a try and let me know how it turns out for you and your family! Yes Kath! Definitely! I am actually testing out a crock pot recipe for tonight’s dinner. I have been posting some photos on Weeknite Meals’s FB page, but haven’t had a chance to post here for a while. Work has been stressing me out a bit and I have not been inspired to blog… Sorry about the lack of activities!